Once everything useful has been teased out of the biomass, water gets squeezed out of what remains in this accordion-like filter press. The solids fall to a conveyor below, nudged by workers like Drew Christensen, and are burned to produce biogas. Of the three commercial-scale plants, one in Hugoton, Kansas, went on the sale block in 2016 and in November, DuPont announced it is looking for a buyer for its Nevada, Iowa, plant. That just leaves Project Liberty in Emmetsburg, Iowa, built and run by POET-DSM. It’s adjacent to a POET grain ethanol facility, but the cellulosic plant is readily identified by large stacks of bales of what the industry calls corn stover. When the plant reaches full capacity, it’ll process 770 tons of biomass, POET-DSM spokesman Matt Merritt says. It’s not there yet. 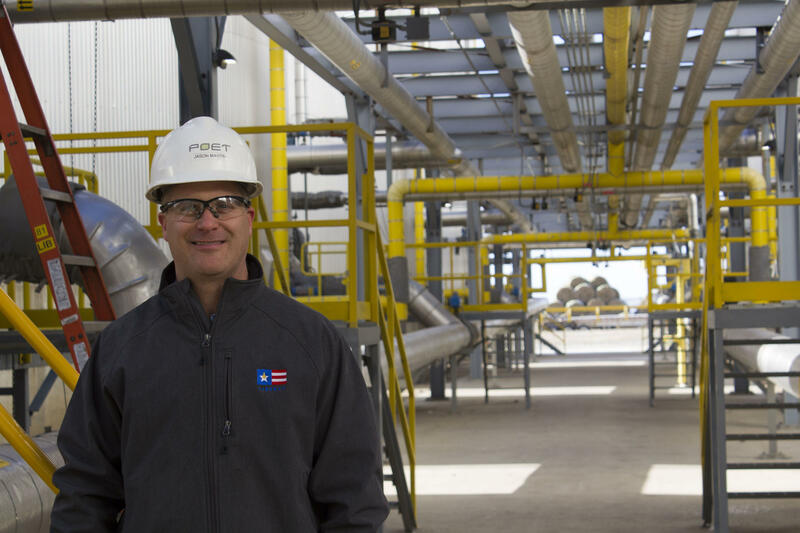 Project Liberty general manager Jason Martin has overseen troubleshooting at the cellulosic plant operated by POET-DSM in Emmetsburg, Iowa. 1. Farmers pull a baler over their harvested fields and collect no more than 20 percent of the leaves, cobs, stalks and other matter left from the season’s corn — aiming to keep enough organic matter on the fields to sustain soil health. 2. The square or round bales of heavy, wet, biomass enter a huge warehouse-like space at the plant. The bales first pass through a machine that removes the netting or twine holding the material together. Then, giant metal fingers shred the material so nothing is bigger than 4 inches. What remains is shaken to wrest free rocks, bits of metal or other foreign pieces that won’t break down during the chemical process. Project Liberty general manager Jason Martin says cellulosic ethanol is a different world compared to the nearly uniform corn kernels that become grain ethanol. 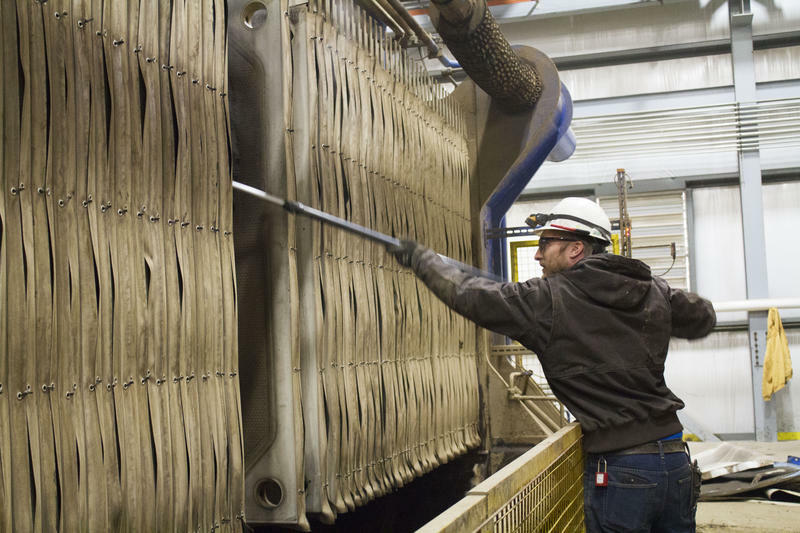 “The plant material is really tough and abrasive,” Martin says, “and so you just have to throw more steel and power at it until you figure it out.” That means bigger, stronger machines, which cost time and money. 3. The biomass slurry travels through pipes and into a giant reactor, Martin says, though it’s still hard to keep the material moving. 4. Eventually, enzymes get added and everything sits in a series of tanks and ferments into ethanol that performs in the fuel supply exactly the same way grain ethanol does. The entire process takes eight days. What’s less solid for the cellulosic industry is government support via mandated volumes of cellulosic ethanol. The Environmental Protection Agency lowered the 2018 cellulosic mandateunder the Renewable Fuel Standard, but not by as much as it initially proposed. And some states, including California and Oregon, have their own requirements for low-carbon fuels, which increases the market for ethanol. Baled residue from area cornfields provides the biomass that becomes ethanol at Project Liberty. Business consultant Michele Rubino expects other coastal states will follow in enacting low-carbon fuel mandates. But when it comes to companies’ interest in cellulosic, he says, oil prices are still a major factor. POET-DSM looks to be in the business for the long haul, based on its investments in Emmetsburg, says Rubino, who’s been following developments in biofuels for more than 20 years. DuPont seemed committed when it opened a commercial cellulosic plant in Nevada, Iowa, but after a merger, the corporate outlook changed. “It’s not in that DowDuPont sweet spot,” Rubino says. Instead, DuPont spokeswoman Wendy Rosen tells Harvest Public Media, the company plans to leverage what it has developed and learned into licenses for the technology, which “are pending the final outcome of the sales process for the business.” Licensing the technology, especially overseas, was a stated goal of the company when it opened the plant. Merritt says POET-DSM shares that vision with Project Liberty. In the case of POET-DSM, it likely has an interested party in POET, the joint-venture partner that is a major global biofuels producer. And Rubino says he expects another wave of interest in cellulosic. That guy, so to speak, in Kansas is Synata Bio, the company that purchased the Abengoa plant in Hugoton after Abengoa had financial problems independent of the plant. It’s unclear when cellulosic ethanol production will resume there. While large corporations can pick up and drop whole industries from their portfolios, farmers and rural communities aren’t as nimble. Nevada, Iowa, invested more than $600,000 to annex land and offered DuPont tax increment financing with hopes beyond the one plant. 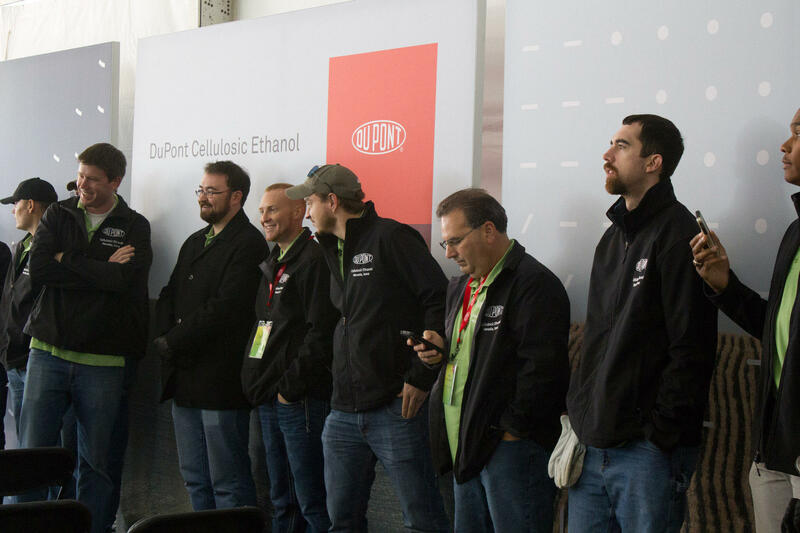 With much fanfare, DuPont opened a cellulosic plant in Nevada, Iowa, in 2015. But the company has announced it will close and sell the operation, costing about 65 people their jobs. Instead, about 65 people will lose their jobs before the start of the new year. And area farmers, who made a little extra money selling the corn residue off their harvested fields, saw a new income stream disappear amid a four-year downturn in the farm economy. 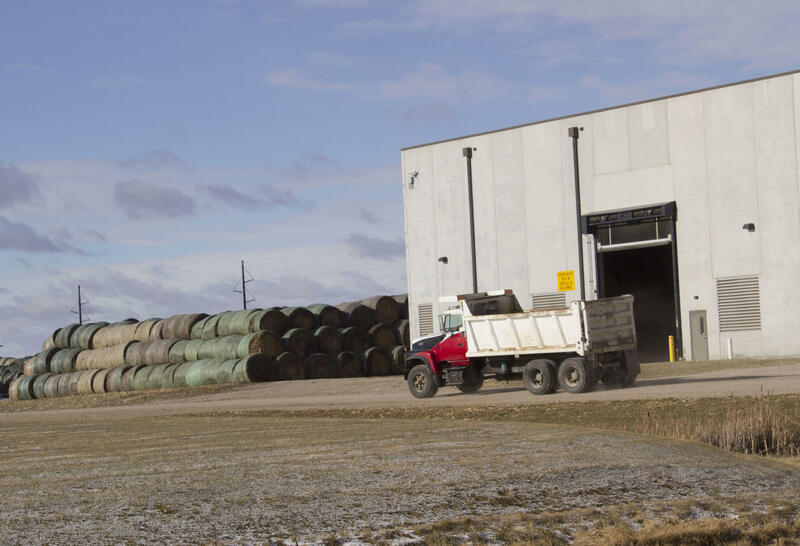 One farmer told the Ames Tribune his stover contract amounted to more than 10 percent of his revenue in 2015 and an area baling company paid part-time workers $5,000 each for three month’s work collecting the biomass from local fields. 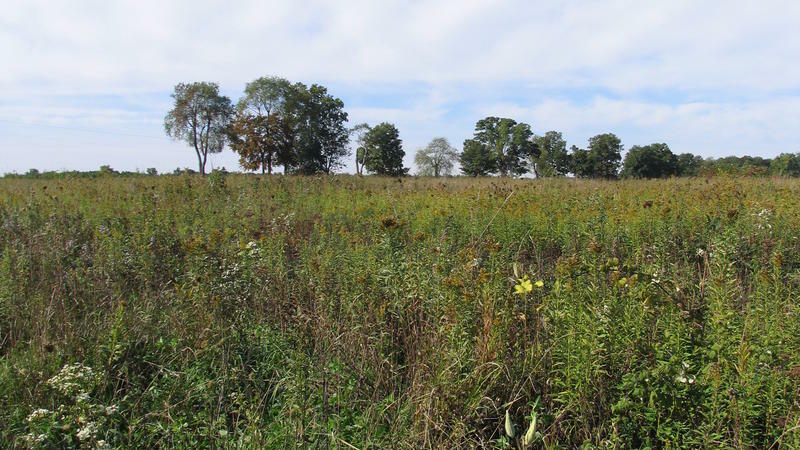 Could Some Midwest Land Support New Biofuel Refineries? Millions of acres of marginal farmland in the Midwest — land that isn't in good enough condition to grow crops — could be used to produce liquid fuels made from plant material, according to a study in Nature. And those biofuels could, in theory, provide about 25 percent of the advanced biofuels required by a 2007 federal law. But there are many ifs and buts about this study — and, in fact, about the future of advanced biofuels. Biofuels made in the Midwest from corn stover, the leftovers of harvested corn plants, may be worse for global warming than gasoline in the short term, according to a recent study. It’s casting doubt on the greenhouse benefits of cellulosic ethanol.